Heat oven to 400°F. In ungreased 13x9-inch pan, mix soup, corn and vegetables. Bake 10 minutes. Crush 1/2 cup of the onions. In shallow dish, mix crushed onions, Bisquick mix and lemon-pepper seasoning. In another shallow dish, place water. Dip chicken into water, then coat with Bisquick mixture. Place chicken on corn mixture. Drizzle melted butter over chicken. Bake 20 minutes. Sprinkle with remaining onions. 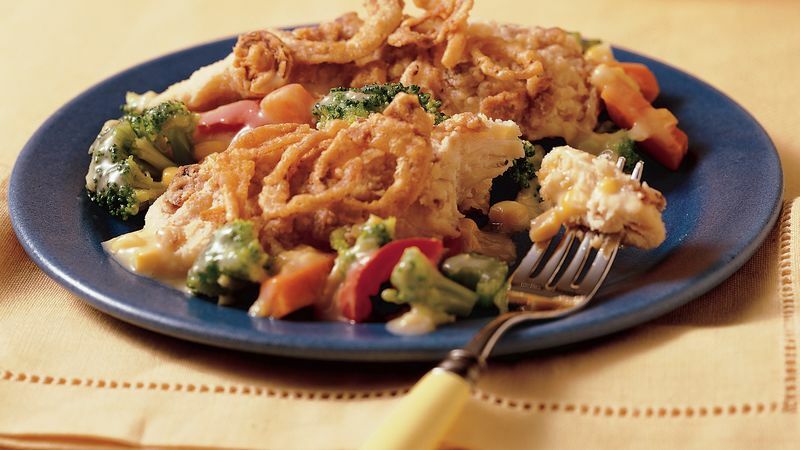 Bake 10 to 15 minutes longer or until onions are golden and chicken is no longer pink in center. For a cheesy version of this hearty dinner, use an 11-ounce can of condensed Cheddar cheese soup instead of the cream of chicken soup. No lemon-pepper seasoning on hand? You can use seasoned salt or pork seasoning instead.